I am having trouble finding where the code lives which tells Blender what properties to build into the UI by default. I was assuming this would live in a Python file somewhere, but simply doing a search of all the files I was unable to come up with anything that looked like what I'm trying to find. Specifically, I see that by default in the world settings, there are 2 choices for rendering Indirect Lighting "Raytrace" and "Approximate", and switching between them enables/disables Indirect Lighting. I want to change this so it does not become disabled. Where can I find the code where this is being set up? Hovering over the button I can see the Python binding, but when I search the code for parts of that string, I come up with only C files and I don't see any enabling/disabling going on.. but maybe I don't understand how this is working. Any pointers appreciated. For Blender Render, there is no raytraced Indirect Lighting, which is surprising, but also the Approximate Indirect Lighting is rather broken and looks totally wrong. It appears to me that some of the cached data has normals going the wrong direction or something. Both of these factors make baking Indirect using Blender Render useless. Approximate is also broken in that you can have Occlusion+env lighting OR Indirect Lighting, not both. I have verified this behavior looking at the code. Fixing this should be rather simple and is on my todo list. I will also check out the code for Approximate and see if there is anything I can do there. The Cycles Renderer is beautiful, but as many of you know it lacks a bake feature which makes it useless for games or even baking expensive scenes for film. Adding a bake feature would be hugely valuable IMHO. From what I understand the way Cycles works internally it might make baking a rather difficult feature to add, though I'm sure it could be hacked to do it, I figured it would be simpler to implement my own Indirect Lighting inside the Blender Render. I now have a working raytracing version of Indirect Lighting written in a way that can hopefully be patched back to the main branch of the repository relatively painlessly. My only issue at this point is figuring out how/where the built-in properties can be changed so when I choose "Raytrace" mode, it doesn't disable the properties for Indirect Lighting. 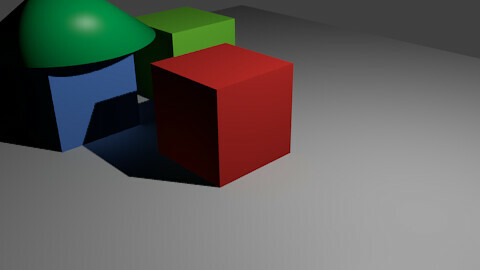 I will attach a test render to show my Raytraced results compared to Approximate. I will say that the brokenness of Approximate looks very much like an early test render I did where I was getting normals facing the wrong direction. I had to bake out a pointcloud to debug my situation. My implementation of Raytracing Indirect Lighting. A - Shows problem of floor sampling the cube incorrectly, whatever is happening here, it is not getting a shadow on the box. B - This area should definitely getting some bounce light from the floor, might also have problem of reversed normals, therefore sampling inside the box. line 2561 it looks like this is where the property for the "gather method" button is being set up. but I'm not sure I would expect that anyway, because there is more than one place which disables/enables the indirect settings.. for example unchecking the indirect lighting checkbox also disables the indirect settings. I don't see anything too significant looking at the actual properties which get disabled/enabled either... which might make more sense as a place to have that information, because they could potentially disable/enable themselves based on certain criteria/context. Alas.. it's not there. At least not from what I can tell. These are rather difficult to read though. I have also searched for the words "Only works with Approximate gather method" and came up with nothing... where is this coming from?? Bah! Just found it. Turns out Windows explorer's search within files failed me again. I resorted to my old favorite linux tcsh search alias and it found it no problem. I even have .py files listed as files to search within in my indexing settings. Lame. This is really lovely stuff. The raytraced version looks just like full GI. It's really exciting, considering the fact that one has full control over the exact amount of colour bleeding from each object. Please keep up the great work.